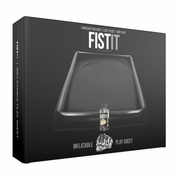 Fist It Inflatable Play Sheet. It's your own personal playpen. This body slide, with its inflatable sides, can be placed on top of a bed, or on the floor, for lubrication play. Comes with a bottle of concentrated lube that produces 5 liters of lube when mixed with water.